Part 1-9 反應熱烈，多謝支持！現正加開 Part 10!! Overwhelming response from Parts 1-9! Part 10 is here NOW!! Interested in internet or IG dance videos? Intended to try dancing without door? Afraid of too difficult for beginner classes? ABC is here! 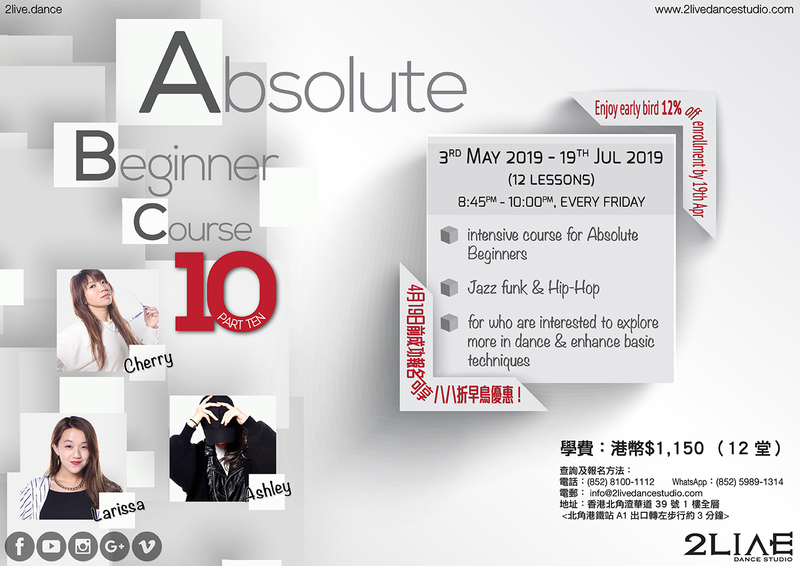 Absolute Beginner Class (ABC) is for those who are totally new to dance without basic! ABCers will be taught the Jazz Funk & Hip-Hop basics by Cherry, Ashley & Larissa, for the sake of basic technique, body coordination & self-confidence enhancement. ABC will commence from 3rd May, 2019 to 19th July, 2019 (12 lessons). Quotas are limited, act now to enroll at 2Live counter! Enjoy early bird 12% off enrollments by 19th Apr! (2) ATM bank transfer (HANG SENG BANK: 390-511657-883) and email receipt to info@2livedancestudio.com with enrollment details Call 8100-1112 or Whatsapp 5989-1314 for enquiry!